You’ve seen the post: a plea for 52 Thoroughbreds living in limbo after their owner died and his son wasn’t interested in keeping them. You’ve probably been tagged, texted or called by well-meaning horse friends rallying to save the herd. There’s only one “problem”: They’ve already been saved. In fact, they’ve been safe since the original post went viral in 2011, but each year the call circulates again. 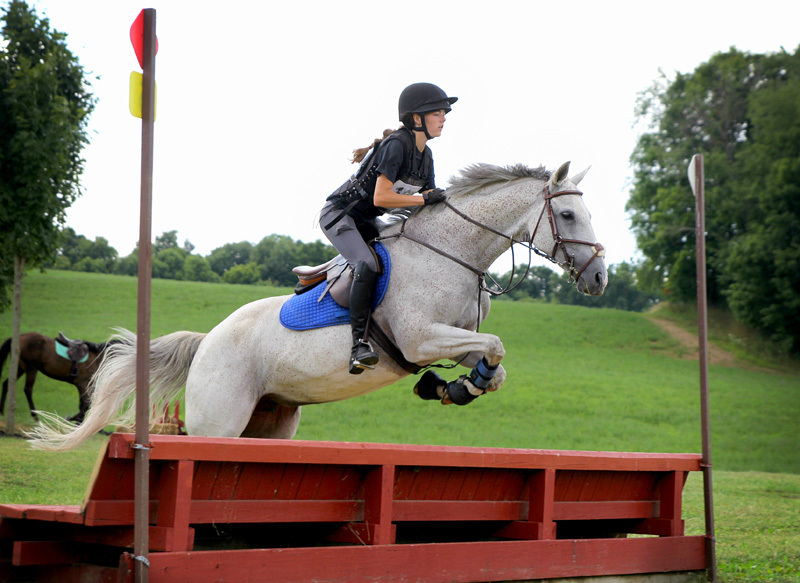 Katherine Trimble, the executive director at Trinity Farm Therapeutic Equestrian Center in Streetsboro, Ohio, is accustomed to the perennial wave of concerned equestrians. Mayzie, or “Gray Hot Momma” as the Jockey Club knows her, was pregnant when her owner Daniel C. Stearns, DVM, died on Jan. 27, 2011, and left his herd of Thoroughbreds behind. Lynn Boggs, a close friend of Stearns, shouldered the task of finding homes for the horses on short notice. She posted on Facebook, and four days later the horses had all found safe landings. Trainer Joanne May heard about the horses from Kate Morgan, an outrider at the Thistledown Race Track in North Randall, Ohio. May has experience with foaling and offered to give one of the pregnant mares a home because she knew they would be harder to place. Mayzie (May called her “Momma”) arrived on Jan. 31 and gave birth to a healthy colt in March. 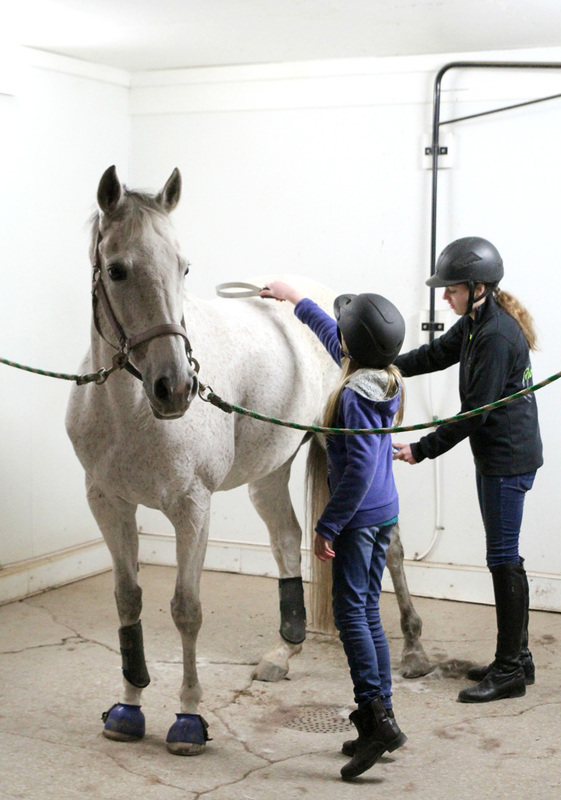 Trimble’s path crossed with Mayzie when she visited May’s farm in 2012 to assess a pony as a possible addition to her therapeutic riding program, but he wasn’t the right fit. May offered to show Trimble her other horses for sale, and Mayzie immediately caught Trimble’s eye. Katherine Trimble credits Mayzie’s exceptional ground manners to her experience as a broodmare. Mayzie was far from the type of horse Trimble usually chooses for Trinity Farm’s therapeutic program. She was a 9-year-old mare coming off maternity leave whose only long-term under saddle experience was at the race track, but Trimble had a good feeling about her. That rider was Madalyn Rusinoff, 17, who has been at Trinity Farm for nine years. 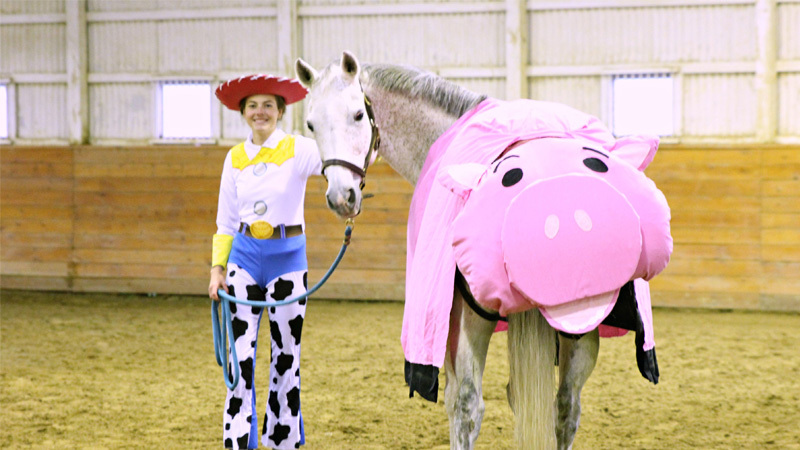 She was 11 when Trimble bought Mayzie and was thrilled to have her very own “project horse” to work with. Rusinoff now leases her, and the two are schooling novice level eventing with the goal of moving up to training level. Rusinoff knew Mayzie’s story but didn’t understand the significance of Mayzie’s origins until she was old enough to get tags and calls about the post. Madalyn Rusinoff hopes to have Mayzie as a partner for as long as she enjoys working. Rusinoff’s experience at Trinity Farm has inspired her to seek her own Professional Association of Therapeutic Horsemanship certification. She hopes to someday teach lessons and train horses. In the meantime, she’s eager to have Mayzie as a partner for all upcoming adventures.